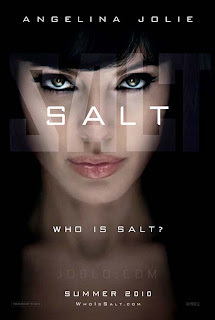 The entire time I was watching this I was picturing Tom Cruise in the role of Salt. I couldn't get the idea of it out of my head and honestly it doesn't seem much had to be done to the script to make this fit Angelina Jolie's persona. Seeing as this ended up being a Jolie action pic though-it is clearly for the best. If this had ended up being a Cruise picture it would have simply been another secret agent character we've seen Cruise play before. And though Jolie has played in her fair share of action movies she has never really played one in the vein of Evelyn Salt. Salt is a movie with a pretty out there concept, but one that works because the people involved are so committed to making this work. Besides Jolies full-on tough girl act and inner-conflicts she unravels as the story goes on, we also have the great Liev Schreiber and Chiwetel Ejiofor taking the roles of the guys responsible for tracking her down and catching her. They are stock characters but the gifted actors make these chases all the more intense and interesting. The action scenes are the clear highlight of the film-Jolie takes some serious beatings and risks as she leaps from 18 wheeler to 18 wheeler and breaks into funerals and shoots up presidents as well as murdering twenty men without getting so much as a scratch on her. These entertaining pieces of violence are intertwined with flashbacks that flesh out Salts past as well as many a shots of her sneakily stealing things without anyone ever seeing. Sometimes the flashbacks come off a tad cheesy and the relationships between people are never sincere enough that we really buy into it. Especially the awkward marriage between Salt and her barely there husband. Although his presence offers reason for her change of heart and ultimately a turn in the plot, the emotional pull is never there and the final twist comes off as a bit of a lost cause-as if the writers weren't sure how to wrap this all up so they contrived it in ways that make it even harder to believe. Lets face it though, 'Salt' isn't about the relationships or the unbelievable plot, but it is about the action and the fun and if there was only one thing to say about 'Salt' it would certainly be it is a fun ride. A passable summer action flick at the very least.